Friends and colleagues of Mitch Hornecker turned out Wednesday night to honor him for his dedication and commitment to the Portland community. Hornecker is this year's recipient of the William S. Naito Outstanding Service award. The award is presented annually by the Portland Business Alliance in honor of the late Bill Naito, a leader in the Portland business community who also spent his life working to make Portland a better place for all of the city's residents. In accepting his award, Hornecker told the audience his philanthropic journey began shortly after he graduated from law school and started working as a lawyer at Schwabe, Williamson & Wyatt. Encouraged by his employer, he started volunteering with Greenhouse. The program, which was operated by Salvation Army, worked with homeless youth. As he learned more about homelessness and got to know the young people in the program, he started a legal clinic to help them. Eventually he and others who volunteered with the Greenhouse program decided to create their own nonprofit, New Avenues For Youth. The nonprofit is dedicated to the intervention and prevention of youth homelessness. Hornecker, who left his law practice to serve as president of Howard S. Wright before becoming a partner at Modoc Consulting, also serves as a member of the allocation committee for Portland Children's Levy and recently joined the board of directors for Meyer Memorial Trust. He urged members of the audience who had come to honor him to come together to find a collective solution to solving the city's homeless situation. "We need you to come off the sidelines and get involved with a bold new plan and bring your resources to help solve homelessness," he said. 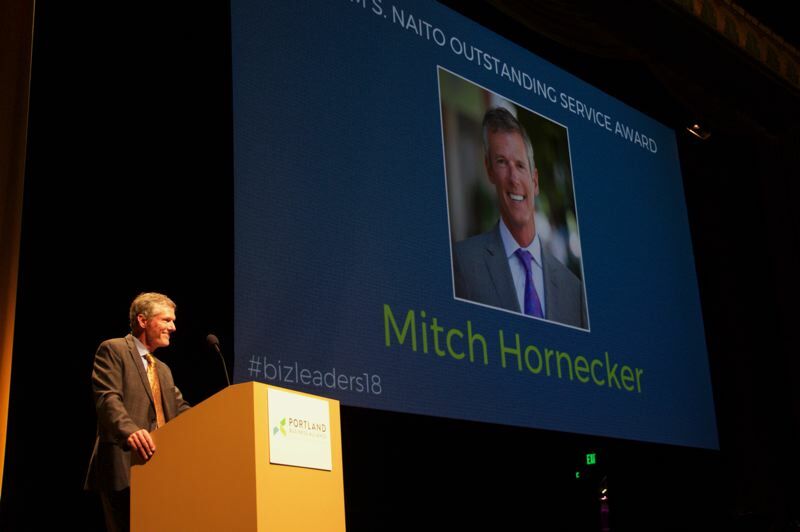 The presentation of Hornecker's award was part of the 2018 Business Leadership Evening, which was held at the Portland Art Museum. Michelle DePass, president and CEO of Meyer Memorial Trust, was the evening's keynote speaker. A portion of proceeds from the awards event were earmarked to go to the Red Cross to help those impacted by wildfires in California, Andrew Hoan, PBA president and CEO, said.